Lightly sweetened with maple syrup, these rainbow carrots make a great side for any meal! My favorite form of social media is Instagram. What's better than a place where I can find meal inspiration and suffer from severe food-envy in the matter 10 seconds? Probably actually eating the food in these pictures...but that's a small detail. One thing that I've really been inspired by is the vibrant colors I see all over my feed. It makes me motivated to introduce new ingredients and veggies to my dishes, because who doesn't want to eat pretty food that tastes good? While they aren't a new to me veggie, rainbow carrots remain one of my favorite veggies to cook up. If you're not familiar, you need to be. The different carrots vary just slightly in taste, which is most prevalent when you eat them raw. For instance, purple carrots are slightly sweeter than traditional orange and you'll find the white carrots to be a bit more mild. The yellow carrots are also sweeter and my personal favorite! Plus, each color is packed full of different nutrients. To make the most of this, you should definitely eat each of the carrots. All of the carrots, in fact. The glaze on these carrots plays off their natural sweetness perfectly so you can enjoy these without having to worry about the carrots being overpowered. Plus, it's only got 4 ingredients, so you know it's easy to make! 1. Preheat oven to 425 degrees.2. Coat carrots in melted butter/ghee/oil and place on a baking sheet. Put in oven to cook for 15 minutes.3. 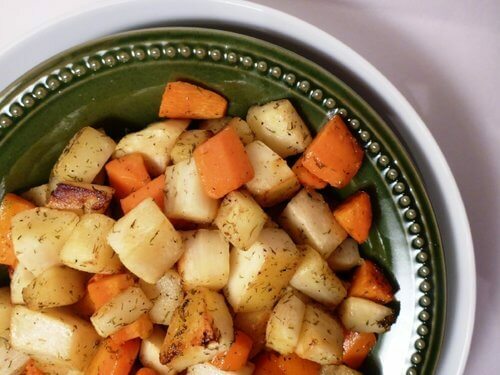 While cooking, combine syrup, ginger and apple cider vinegar in a small sauce pan and bring to a boil. Turn down to a simmer and allow to thicken for 5-10 minutes until your carrots are done.4. Pull carrots out of oven and turn it down to 350 degrees.5. Evenly glaze all sides of your carrots. Use a basting or pastry brush to make this easier!6. Bake for an additional 15-20 minutes until tender to your liking. Remove and let cool briefly before serving!